Welcome to inspire… where we offer an authentic connection between mind, body, emotion and nervous system. Nestled comfortably in the community of Signal Hill, we hold space for those who seek support on their wellness journey. Within each of us lives a spark of desire to live well, feel balanced, whole and nurtured. Our primary intention is to guide you in this process through our many offerings provided by nurturing and respected professionals. Inspire Centre & Signal Hill Community – right on trend! According to the Global Wellness Institute, Signal Hill is right on trend with having Inspire Centre nestled in the community! We look forward to being your wellness destination. 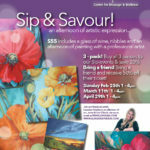 $55 includes a glass of wine, nibbles and an afternoon of painting with a professional artist. NOW – Buy ONE bring a friend FREE!